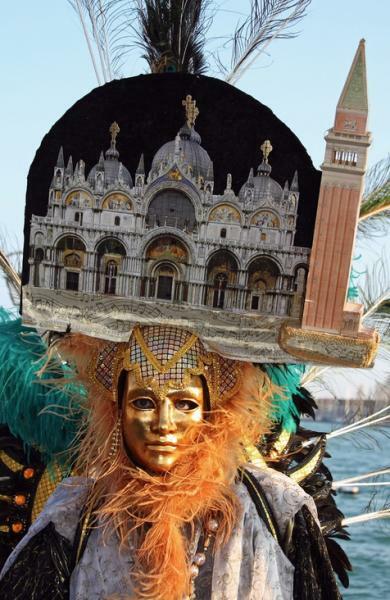 The origins of carnival in Venice go back to at least the 14th century, perhaps even the 12th, and may have begun with the celebration of an obscure victory over the Patriarch of Aquileia. People got in the habit of an annual meeting in Piazza San Marco. By Renaissance times it was official; by the 1600s, when Venice was in its decline, it became one of the city's money spinners; its length expanded continually, until it took up nearly half the year. There were gambling dens (the famous Ridotto and various casini), brothels, theatres, wine bars, cafés, exotic animal shows, ropewalkers and jugglers, all encouraging the locals and visitors to part with their cash. Most striking of all were the masks. With the strict hierarchy of Venetian society, these offered nobility and commoners alike a chance to relax and wander the streets, enjoying all the delights of anonymity. Their first mention in Venice dates May 2, 1268, when a decree made it illegal 'to throw scented eggs or gamble while wearing a mask'. In 1339, a new law prohibted Venetians from wearing masks when visiting convents. By 1436 they were so important that the mascherari ('mask makers') founded their own scuola. Masks were generally made of leather or porcelain. Some represented (or became) figures from the Commedia dell' Arte, while the most common was the bauta, a white mask exclusively for men with the very pointy chin, worn over the whole face with a black cloak (tabarro) and tricorn hat, as often portrayed by genre maestro Pietro Longhi in his paintings. The bauta disguise was also occasionally required dress—when the state wanted citizens to come together to vote anonymously. Other popular masks were the pure white volto or larva ('face' or 'ghost'), similar to the bauta, only longer (so it was impossible to eat or drink without taking it off) and the long beak-nosed plague doctor (il medico della peste). Initially, masks were allowed from St Stephen's Day (26 December) until Shrove Tuesday, and on other holidays. Eventually the period stretched to nearly half the year. The party-pooping French banned Carnival and the wearing of masks, and the Austrians hardly encouraged it, although in the 19th century there were occasionally private parties. After the Second World War, there were mostly pranks in the streets—like the once-banned throwing of eggs. In 1979, the Italian government decided to revive Venice's historic carnival to promote interest in the city's culture. By any measure it has been resounding success, drawing some three million visitors every year, with a full range of events: historical boat processions, concerts, evening shows at the Arsenale, fireworks, fashion shows, acrobats, masked balls in the palazzi and the conversion of St Mark's Square into a Gran Teatro by the set designers of La Fenice for the Festa delle Marie and the Flight of the Angel, when the most beautiful 'Mary' from the previous year descends from into the piazza on a wire from St Mark's Campanile. On the last weekend of Carnival the winner of la maschera più bella ('the most beautiful mask') is decided by a panel of international costume and fashion designers. There are other 'flights' from the Campanile, of the Eagle and winged Lion, and then music and dancing throughout the night on Mardi Gras Tuesday.